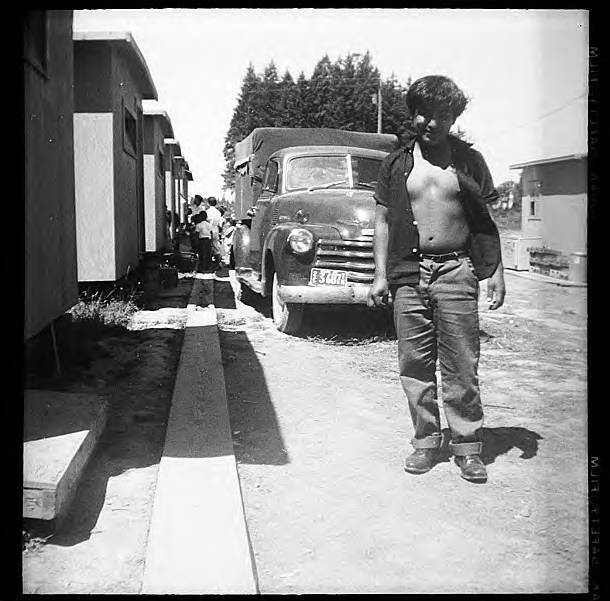 Black and white image of a young boy standing next to a row of small houses. A board runs along the ground in front of the houses as a sidewalk, and a truck with a covered panel back is parked behind him. The young man wears jeans, shoes, and a dark shirt and smiles toward the photographer. In the background a group of adults and children are gathered in front of one the small houses. Museum records identify the people in the image as members of a group of 'potato pickers.' Migrant farm labor has been an important part of agriculture in Washington County since the early 1900s, though the cultural groups which provide the majority of the laborers have changed over time.